There remains a lingering feeling that setting up a network attached storage device can be complicated, time consuming and fiddly. Buffalo aims to dispel these preconceptions with the Cloudstation Duo, a NAS kit designed to be as user friendly as possible without losing any features or functionality. The device itself is compact, though quite heavy. Flicking open the front gives quick access to the two 1TB hard drives that come installed. Removing the drives is a bit fiddly at first, but the process is certainly a lot easier than with many other NAS drives. 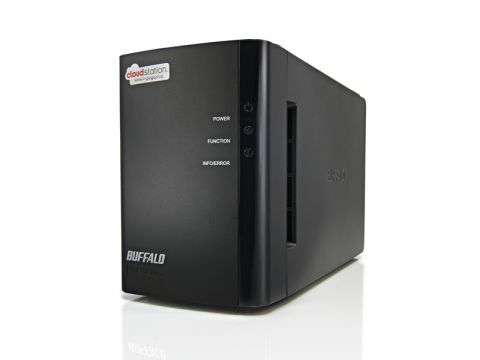 The fact that the Buffalo Cloudstation Duo is supplied with two large hard drives already installed and set up in a RAID 1 configuration is great, and eliminates a more fiddly and complicated part of the setup procedure. Installation involves visiting the Cloudstation website and going through the easy to follow step-by-step walkthrough. It took us just a couple of minutes to set up the device, and the majority of settings were dealt with behind the scenes. However, we had to wait for an activation email to be sent before we could start using the device, and it took quite a long time for it to be sent. While we were waiting for the confirmation email, we downloaded and installed the desktop application that allowed us to view and browse files stored on the Cloudstation Duo without having to trawl through the various Windows networking options. You can also map the device so that it appears in Windows as an installed hard drive, though we had a few problems when we tried this. We received an error 'Remote Default Share is Missing' – a seemingly common problem that requires some fiddling to fix. Copying files to the device is quite slow, averaging about 11MB/s, so large backups are going to take a while. Features like an online browser for remote computers and a built-in torrent downloader are welcome, but the Buffalo Cloudstation Duo isn't quite as easy to use as it should be.